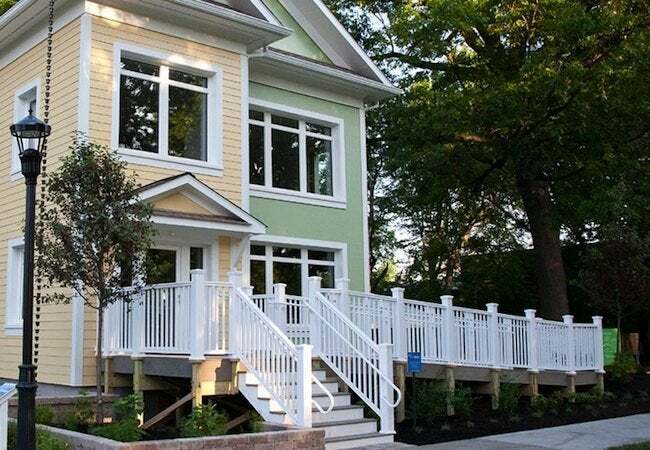 Learn how one happy couple just couldn't pass up a striking house that incorporated energy-efficient building technology and the comfort and precision of Mitsubishi Electric zoned heating and cooling systems. While visiting their son and his family in Cleveland, Marty and Jocelyn Schaffer went out for a drive. Along the way—much to their own surprise—they bought a nearby house. Here’s how it happened: On a street in the historic district of Wade Park, a unique building seized their attention. They soon discovered it was the PNC SmartHome, developed by the Cleveland Museum of Natural History. The concept house had completed its run as a museum exhibit and was now being offered for sale. The Schaffers, long interested in high-performing, energy-saving design, arranged a tour for the same day. Three hours later, they made an offer, and within 30 days, it was official. They are now the proud owners of an unusual dwelling, a home in Cleveland built without a furnace. As a certified passive house—a home built to the world’s most demanding residential energy standards—the PNC SmartHome pulls off a remarkable feat of efficiency, in no small part because its indoor climate control needs are met not by a central forced-air system, but by a system from Mitsubishi Electric US, Inc. Cooling & Heating (Mitsubishi Electric). Working in concert with the energy-smart hallmarks of passive house design, such as airtight construction, advanced insulation, window technology and heat recovery ventilation, Mitsubishi Electric enables the Schaffers to enjoy lower utility bills from one month to the next. In fact, compared with a conventional home, the PNC SmartHome consumes up to 90 percent less cooling and heating energy! What makes a Mitsubishi Electric zoning system so efficient? First of all, it requires a relatively small amount of electricity to power its normal operation. Second, the system sidesteps the notorious inefficiencies associated with traditional installations and their leak-prone ductwork. Believe it or not, air ducts commonly lose enough energy to compromise overall system efficiency by up to 25 percent. Mitsubishi Electric achieves superior efficiency by distributing air directly into the conditioned space rather than through a network of ducts. However, of all the groundbreaking features that distinguish Mitsubishi Electric, none manages to save more energy (or provide more practical benefits) than its zoning capability. In a typical home with a central system, one thermostat governs the temperature of the entire house. But with zoning capabilities, the Schaffers get room-by-room customization. That’s because their PNC SmartHome contains multiple zones, each independently controlled. 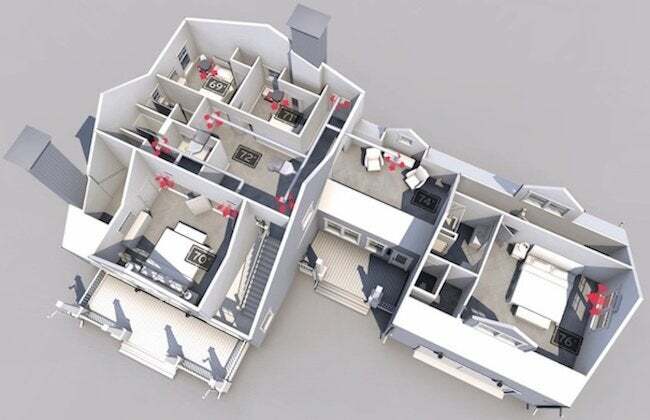 Instead of cooling or heating the entire house in order to bring comfort to one room or floor, the Schaffers can target the zone they are occupying. So, for example, they can warm the bedrooms on the second story while opting to save energy—and energy dollars—by not running the system on the empty first floor. In addition to cutting energy consumption and costs, there’s a bonus: Thanks to a Mitsubishi Electric zoning system, people with different temperature preferences can finally all be comfortable at the same time. No more thermostat wars! Precision control really matters, for so many reasons. Performance matters too—for the Schaffers and for everyone else. 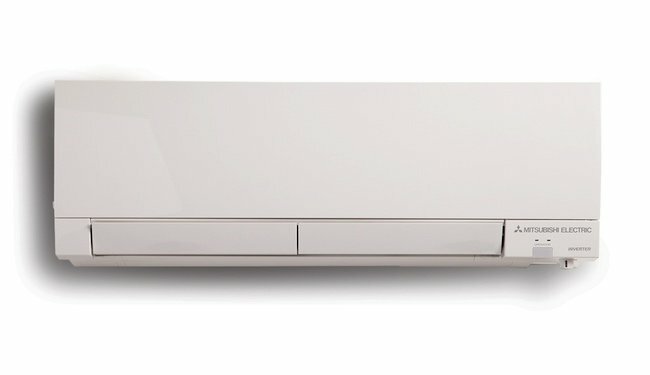 Fortunately, without any sacrifice of efficiency, a Mitsubishi Electric zoning system delivers cooling and heating of a caliber greater than common central forced-air systems. Many homeowners find traditional forced-air systems frustrating, because from the ground up they are designed to cycle on and off. The inevitable result? Uncomfortable temperature swings. Rather than working in stop-and-start fashion, systems from Mitsubishi Electric operate continuously, actively adjusting their output to match the demand at any given time. The temperature does not waver from the temperature set on the thermostat. Whether it’s the PNC SmartHome or your own home, a Mitsubishi Electric zoning system ensures a steady, stable environment. Cleveland isn’t known for extreme weather, but its warm and humid summers and cold winters mean that for several months of the year, the Schaffers rely on indoor climate control. Whereas most cooling and heating appliances supply one or the other, the versatile Mitsubishi Electric system provides both. In cooling mode, it draws heat from inside the home and deposits it safely outside. Then, whenever the temperatures drop in late fall, the system automatically reverses the action, causing the system to collect heat from the outside and bring it indoors. That’s right: Even at temperatures as low as -13 degrees Fahrenheit, Mitsubishi Electric systems equipped with Hyper-Heating INVERTER™ capability can collect heat needed to keep the home toasty warm throughout the coldest days of the year. Historically, climate control has forced homeowners to choose between savings and comfort, but the Schaffers didn’t have to make any sacrifices. Thanks to the passive house design of their PNC SmartHome and to the high-efficiency operation and precision control delivered by Mitsubishi Electric, the Schaffers have the best of both worlds: year-round cooling and heating provided by a zoning system that outperforms older technologies even as it keeps the monthly energy bills lower than average. Sure, cutting-edge passive house design may not be available or desirable for everyone, but no matter where you live, you have the option to choose a Mitsubishi Electric system of your own.